Professor Meyerhofer received his AB in physics from Cornell University (1981) and his PhD in plasma physics from Princeton University (1987). After a position as a Research Associate at Cornell, he joined the University as an Assistant Professor of Mechanical Engineering and a Scientist at the Laboratory for Laser Energetics (LLE) in 1988. He was promoted to Associate Professor of Mechanical Engineering in 1993, Associate Professor of Physics in 1996, and Professor of Mechanical Engineering and of Physics in 1999. He is currently the Deputy Director of the Experimental Division at the LLE. Professor Meyerhofer was elected a Fellow of the American Physical Society in 2002. He received the University Dean's Award for Meritorious Service in PhD Defenses in 2003. Meyerhofer is a Divisional Associate Editor of Phys. Rev. 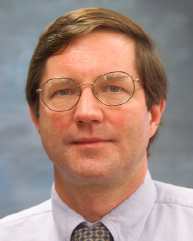 Letters (Jan 2004), an Associate Editor of Reviews of Modern Physics (Nov. 2004), and a member of the APS Division of Plasma Physics Executive Committee (Oct. 2005). Professor Meyerhofer's research interests are in the fields of experimental plasma and laser physics. His experiments cover many research areas relevant to direct-drive inertial confinement fusion (ICF) and high energy density physics. These include hydrodynamics (Rayleigh-Taylor instability), compression, x-ray spectroscopy and thermonuclear burn, the equation of state of materials, and laser-plasma interactions. The primary experimental tools are LLE≠s 60 beam OMEGA laser system and the high energy petawatt OMEGA EP laser system (under construction) at LLE. The research program is focused on demonstrating conditions which scale to successful ignition experiments on the National Ignition Facility, currently under construction at Lawrence Livermore National Laboratory (LLNL). Some of his research is performed in collaboration with scientists from LLNL, Los Alamos National Laboratory, and the French Atomic Energy Commission. A second part of Professor Meyerhofer's research activities involves the interaction of high intensity laser pulses with various forms of matter. When the laser intensity is high enough that the electric field is comparable the atomic field atoms are rapidly ionized and high order harmonics of the laser frequency. Professor Meyerhofer is a member of the University's interdisciplinary program in High-Energy Density Plasma in collaboration with the Laboratory for Laser Energetics. He is also co-director of the University of Rochester Fusion Science Center. For further details, go to Professor Meyerhofer's home page at:http://www.me.rochester.edu/People/Faculty/meyer.html.